After work I popped in to see my sister and the kids. I was greeted with the sight of my niece, absolutely filthy and soaking wet from below the waist. 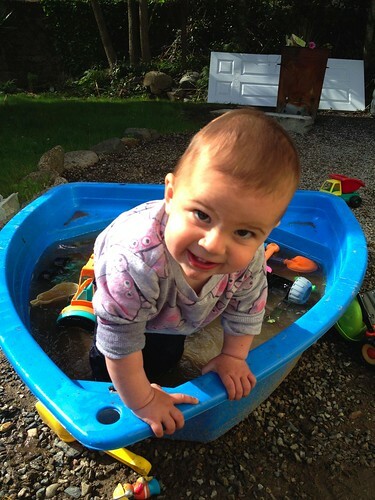 Their sandpit was full of grubby rainwater and Eden, being the grubster that she is, decided that there was much fun to be had getting in and out and splashing the water with her legs. I think she looks so mischievous here! Today I feel tired. I went to bed late last night, much later than I usually do, and then I decided to go to church this morning. The weather here hasn’t exactly been inspiring me to feel energetic today. It is cold and windy and rainy and I just want to go back to bed, which is where The Mister has been all day as he is working nights. At lunchtime I took a walk to my aunt and uncles house as I had invited myself for lunch and on the way home I was pondering what picture I should take today. 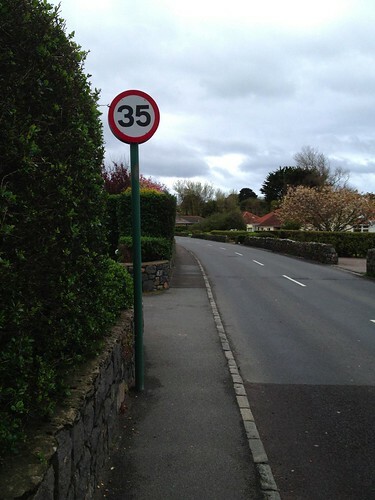 This road sign shows 35mph, which is, in fact the highest speed limit on the island. Most of the smaller roads are 25mph. I guess the pace of life is generally slower over here and on a cold, wet grey day it certainly feels more relaxed and chilled out. Maybe the speed limit reflects that too. Tonight I went out for dinner with all the girls from choir as it is the 10 year anniversary of the formation of the choir, Bel Canto. We had a lovely meal in a private dining room at a restaurant overlooking the harbour and this photo is the scene as the light started to go. 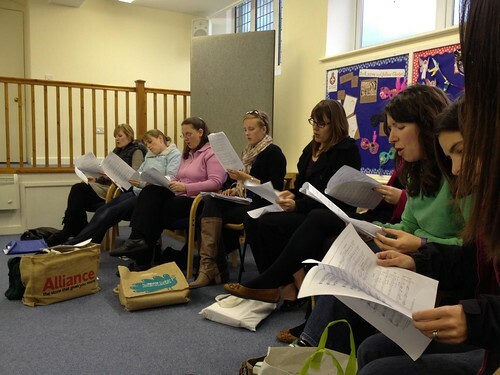 This particular choir has been going for 10 years, but the Guernsey Girls Choir preceded it and that was where we all started. From the ages of about 12 – 18 I sang with Guernsey Girls, we did concerts, toured a bit and generally had fun. What a realised when I went back to Bel Canto at the end of last year was that Christine our conductor hasn’t changed much at all and she still tells me off for all the same things she was telling me off for when I was 14 years old… ie. talking, backchat etc etc. It was good to spend time with everyone. Time out together matters. We like singing, but we also like chatting and gossiping. It’s just one of the things that makes Bel Canto super special! Tonight I am babysitting for Barnabas and Eden. My sister and brother-in-law have gone off to some posh dinner where she is giving a speech about the charity. I am sitting on the sofa in my comfy clothes watching the TV – seems like the wrong way around to me! Fortunately The Mister came and helped me bathe them and put them to bed, it is much easier when you have one each. Before my sister left she commented that Eden was being a bit of a pickle at bed times and refusing to go down. Is it wrong to be feeling especially smug that she is sound asleep about 15 minutes after I put her to bed? Mum and Dad are on holiday in Israel at the moment which means that The Mister and I are in charge of tending his plants. This could be a disaster as inevitably I show much less concern that he does. Fortunately we have had quite a bot of rain over the last few days so we don’t have to worry about all the ones that are outside… so just the greenhouse ones to not kill off! 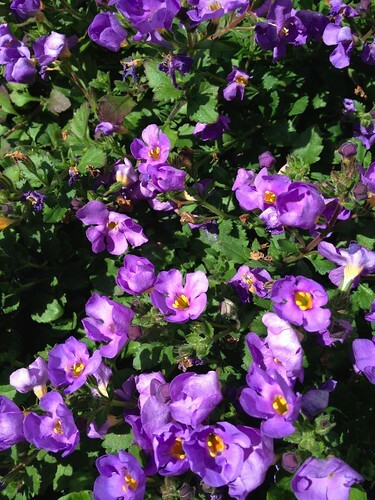 These gorgeous purple flowers are growing outside so have been well watered (what drought?!!) and I think they are going to look gorgeous when Dad finally pots them up in his hanging baskets! I know this is a really, really dull photograph of some steps but today I have just gone from one meeting to the next so feel like I haven’t had time to do anything. 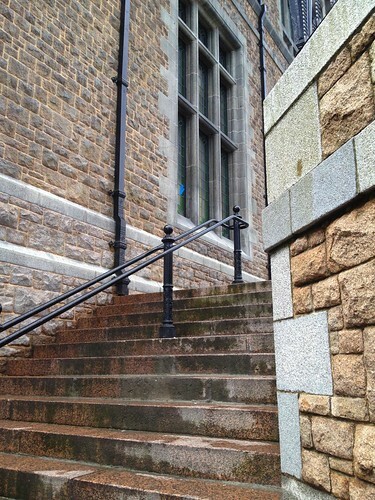 These are the one of the set of steps up to Market Buildings which were refurbished a few years ago. It used to be a proper meat, fish and fruit and veg market and now it is a bit soulless and a bit dull. It has a few shops in it, and a couple of businesses including the Guernsey probation service have offices upstairs. It seems to me they have missed a bit of a trick with it though. It could have been a lovely, quirky, crafty arcade. Instead it is a bit boring. I have to admit that this isn’t my picture today. I have been hard at work stuck in a boring office whereas The Mister is on day off so he went exploring with his camera and this is one of the pictures he took. 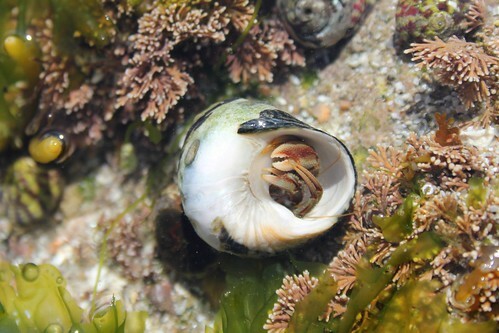 So, here is a super-cute little hermit crab just popping out of the shell. Cute huh? Monday night is choir night. Even though I am knackered going and singing generally makes me feel better. Maybe it is that I am forced to breathe better and it is very de-stressing, or maybe it is that I get to spend time with an awesome bunch of girls! 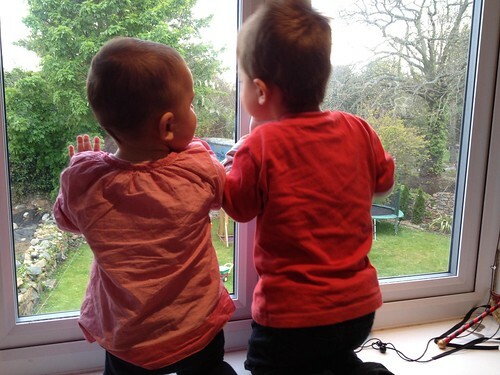 They are going to kill me when they see this photo though… they don’t look too excited do they?! This month marks the 10 year anniversary of the formation of Bel Canto, so we are all going out for dinner. Should be a fun night out. 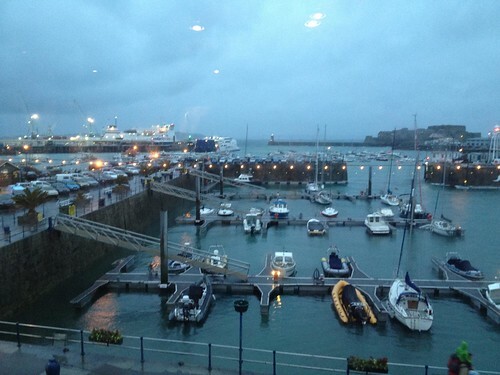 Guernsey… here we come! On a sunny day when the air is cold Dad’s greenhouse is the place to be. At one point both Billy and Justin were reclining next to Dad’s seedlings, admittedly I suspect they were trying to avoid my niece and nephew who seem to think that the cats love being smacked in the face or cuddled hard. Billy is the laziest cat around. 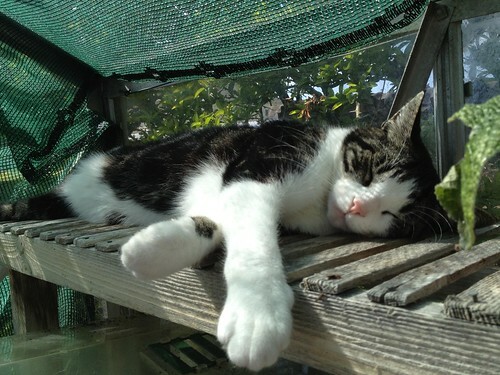 Always found in the warmest spot, making sure that he gets his obligatory 20 hours sleep a day. I love him though. He has the nicest pink nose and pink paws and he is just adorable. 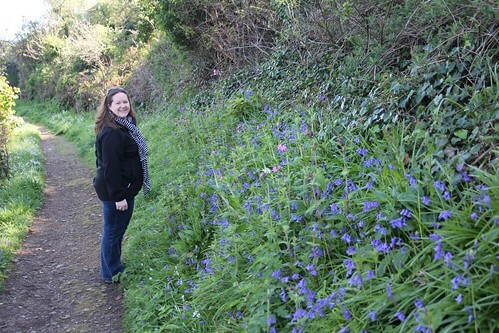 The Mister and I went for a lovely walk through Bluebell Wood.The weather has been a bit weird today so it was a case of going out straight after a rain shower and hoping for the best. The walk took us doewn alongside the Val de Terres which is used for the Guernsey Hillclimb and then out onto the cliffs where we stopped at the Clarence Battery where we had a beautiful view of Herm and Sark and we watched the Condor ferries coming into the harbour. We then cut back through Fort George which is where all the very rich people on the island live and dreamed about which house we would buy if we won the lottery! It was a lovely walk, and as the poor Mister is working most of the weekend we have to make the most of the limited time we get!